Bowser's Snow Fort is the final level of World 4 in Paper Mario: Sticker Star. The boss here is Mizzter Blizzard. 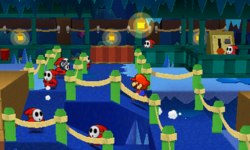 The level is structured similarly to a ride at an amusement park, the ride itself being a mine cart ride is popular with Shy Guys. When Mario enters, there are two lines: the regular line, which if traversed Mario must wait in a continuously replenishing line of Shy Guys; and the priority line, that can only be used if Mario has a Secret Door. The priority line contains no Shy Guys. While traversing the main line, there is a pair of Shy Guys bullying a Toad. Speaking to the group results in the Toad stating that the Shy Guys are attempting to sell him a priority ticket for 100 coins; if Mario pays or defeats the Shy Guys, he obtains a Secret Door sticker. The two Shy Guys are tougher than regular Shy Guys because they attack by cloning and also have 240 HP. As Mario rides along the mine cart, many parts of the ride are missing or misplaced, and skillful use of Paperization is required to progress. Should Mario fail to correctly set up a room while he is riding, he will have to restart the room, or can optionally restart the entire ride. At the end of the ride, Mario exits through the mouth of a massive statue of Bowser made out of snow. Afterward, the statue comes to life, and Mario must face it in battle. Wearing it down reveals that the statue is actually a Mr. Blizzard named Mizzter Blizzard. After the battle, the Mr. Blizzard reveals that all it wanted was a never-melting body before melting away, allowing Mario and Kersti to obtain the fourth Royal Sticker. The music while riding the minecart (named Go, Go Trolly) is a remix of the slide theme from Super Mario 64. This page was last edited on June 4, 2018, at 04:21.